There are a few places that simply offers some extraordinary food that would ensure that you visit the place again to taste some of their delicacies. 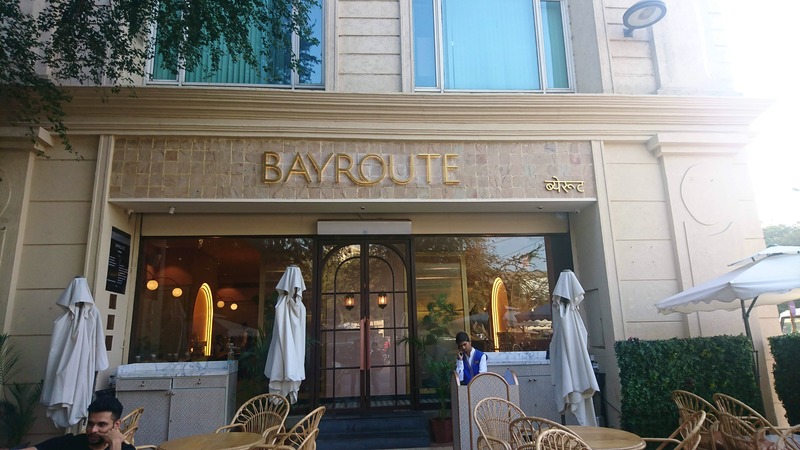 Bayroute is one such place that I decided to visit with a few of my friends, having visited this place when their cuffe parade outlet had opened up. This time there has been a new addition in probably every section i.e cold mezze, hot mezze and even desserts. We decided on ordering a few dishes that we experienced in our first visit and a few from the new additions that were made to the menu. We started off with mocktails and shakes followed by appetizers, mains & desserts. We decided on visiting during lunch hours during weekdays in order to evade the crowded dinner time, but much to our surprise it was full when we reached and had a waiting time of 15-20 minutes. Mocktails: Arabic date palm shake:- The richness is personified on how actually the o.g Arabic dates taste like. This restaurant serves you the finest concoction rich in natural flavours without added sugar. So the natural flavour and richness of the shake were exceptional. Recommended & must try. Salted caramel Baklava shake:- Baklava from the dessert section was one of the finest desserts we had when we visited bayroute and it has a lasting impression in our mind. The new menu has baklava in appetizers & drinks section. Yes, you heard it right, baklava in drinks. The hint of saltiness to the drink is just added to the perfection. The quantity is copious and can be shared between 2 easily. The phyllo served as a part of the presentation was subtle. Recommended! Rehyan:- A repeat from my last visit to this place. A simple, no-nonsense, refreshing drink and a safe option to order if the number of options from the menu confuses you. The only change is in the presentation, rest seems the same. A good one! Appetizers: Fatar Baklava:- One from the baklava family and is classified as Arabic styled tapas or starters. Cuboids of truffle Creamed wild mushrooms filled inside phyllo pastry sheets, pesto Rosso tomato & pine nuts. Savoury items amongst the slightly sweet middle eastern style. Recommended and must order. Raclette Batata Harra:- Compared to the other preparations this was sub-par as it was more like Arabic potato wedges with some cilantro and pepper flakes. A good bar bite if you are having wine or drinks over here. As part of lunch can be skipped. Bayroute Kolokithi:- A very fresh idea of presenting zucchini with a garlic yoghurt dip. The zucchini is sliced into very small pieces and fried and served along with eggplant. The efforts put on even the minute thing is commendable. A good option to start with or even good as an option for bar bites. The yoghurt was really fresh. Muhammara:- The only one from the cold mezze section of the menu. We decided on muhammara simply because hummus was too mainstream and anyways we have tasted it before and muhammara does have a slight edge over it. The main ingredient that makes muhammara more attractive is red pepper and walnut spiked with cumin and gives it a bright colour and amazing flavour and served with pita bread which is one of the best I have had. Surely recommended! Mushroom Kubbat:- An Arabic version of Tikki with a more rich choice of component used to prepare it in an authentic way. The mushroom, aged balsamic gives it an Asian edge as well and dip of sultana raisin which is their take on a chutney appropriate for this khubbat. VFM 4/5 Desserts: Zaffrani Milk cake:- Extraordinary, Just extraordinary. VFM 5/5 Knafi Jibneh:- The preparation of this is as complicated as it is to spell the name of the dessert.K'nafi or Knafeh means an Arabic dessert made of semolina dough or sevaiyya. Sevaiyya is pan-fried and made really crisp and baked with cheese, pista & rose syrup. A very different take on desserts. Hot & sweet. Damages around INR 3,000 for 2 for a proper lunch.